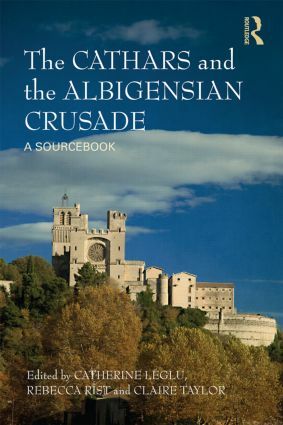 The Cathars and the Albigensian Crusade brings together a rich and diverse range of medieval sources to examine key aspects of the growth of heresy and dissent in southern France in the twelfth and thirteenth centuries and the Church’s response to that threat through the subsequent authorisation of the Albigensian crusade. Aimed at students and scholars alike, the documents it discusses – papal letters, troubadour songs, contemporary chronicles in Latin and the vernacular, and inquisitorial documents – reflect a deeper perception of medieval heresy and the social, political and religious implications of crusading than has hitherto been possible. The reader is introduced to themes which are crucial to our understanding of the medieval world: ideologies of crusading and holy war, the complex nature of Catharism, the Church’s implementation of diverse strategies to counter heresy, the growth of papal inquisition, southern French counter-strategies of resistance and rebellion, and the uses of Latin and the vernacular to express regional and cultural identity. This timely and highly original collection not only brings together previously unexplored and in some cases unedited material, but provides a nuanced and multi-layered view of the religious, social and political dimensions of one of the most infamous conflicts of the High Middle Ages. This book is a valuable resource for all students, teachers and researchers of medieval history and the crusades. Historical Introduction. Section 1: Papal Letters. Introduction. Part 1: Innocent III. Part 2: Honorius III. Part 3: Gregory IX. Section 2: Troubadour Poems. Introduction. Part 1: Political Poems. Part 2: Religion Section. Section 3: Inquisitors. Introduction Part 1: Extracts from Summaries of Crimes and Sentences. Part 2. Extracts from Depositions of Witnesses Interrogated. Part 3: Extracts from Depositions after the Siege and Fall of Monts. Part 4: Extracts from Depositions in the Processus against Peter Garcias. Part 5: Extracts from Depositions Relating to the Circle of Raymond Unaud of Lanta. Section 4: Chronicles and Narratives. Part 1: Extracts from the Song of the Albigensian Crusade by William of Tudela and the Anonymous Continuator. Part 2: Extracts from the Chronicle of Peter of Les-Vaux-de-Cernay Introduction. Part 3: Extracts from the Chronicle of William of Puylaurens Introduction. Part 4: Extracts from the Chronicle of William Pelhisson Introduction. Part 5: Extracts from The Tale of the Heretic. Further Reading. Catherine Léglu is Professor of French and Occitan Literature at the University of Reading. She has published extensively on troubadour poetry and related literary works of the High and Late Middle Ages. She has published two monographs, respectively on satirical poetry (2000) and the theme of multilingualism in Occitan, French and Catalan literature (2010). Rebecca Rist is an Associate Professor in History at the University of Reading. Her research interests include the history of crusading, the papacy, medieval heresy, and Jewish–Christian relations. She has published a monograph on the papacy’s authorisation of crusades in Europe during the first half of the thirteenth century (2009). Claire Taylor is an Associate Professor in History at the University of Nottingham. Her work is on the south-west of France in the high-medieval period, with an emphasis on its religious, political and social life. She has published two monographs on heresy in the region (2005 and 2011).